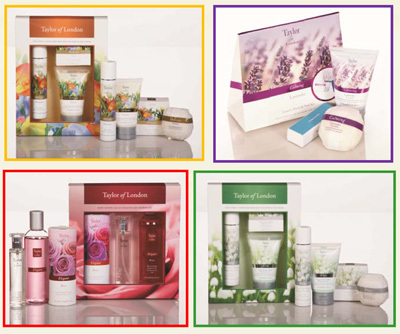 Taylor of London have the perfect gift sets for you! Offering the finest quality ingredients and formulations, the brand is so rich in tradition while also embracing current trends. This is evident when looking at it's modern, stylish packaging. With a variety of products for the bath and body, Taylor of London have created beautiful Christmas Sets for the four exquisite fragrances; Calming Lavender, Elegant Rose, White Lily of the Valley and Delicate Freesia. With prices ranging from $14.95rrp to $29.95rrp they are an affordable choice for quality products. The natural aromatic fragrance blend has calming and soothing properties that uplift and revive the senses. Try the rich nourishing moisturising hand cream. It softens, conditions and hydrates skin with its special moisturising properties, leaving your skin silky, smooth and supple. Taylor of London's Elegant Rose is a beautiful, floral fragrance with a delicate green top note dominated by a velvety rose accord and complimented by jasmine. With roses commonly being associated with love and beauty, why not surprise your loved one this Christmas with this classic, single flower fragrance gift set. The luxuriously creamy soap with cleansing and moisturising properties will leave your skin feeling clean, supple and lightly scented. The delicate and sweet perfume of White Lily of the Valley creates a serene atmosphere. Its bell-shaped, fragrant flowers give an aroma that fills the late spring air with the promise of summer. Pamper yourself with the lusciously scented Taylor of London Lily of the Valley Bath & Body set. The freesia flower is vibrant, yet delicate, like the finest silk. Its delightful fragrance has been enjoyed in England since freesias were first grown at London's Kew Botanic Gardens. Taylor of London Delicate Freesia is a sweet, floral fragrance with white floral notes of freesia and lily, supported by a leafy character and earthy base notes of patchouli and oakmoss. To feel fresh throughout the day, spray the light and refreshing Taylor of London Freesia Body Spray. It's so lightweight and slim you can pop it into your bag. All fragrances in the Taylor of London range are also available all year round with a range of luxury bath and body products.